The Mangosteen is Garcinia Mangostana and is sometimes called the ‘Queen of the Tropical Fruits’. Small round purple fruits contain a white flesh which is regarded as a delicacy. In Australia Mangosteen trees are grown commercially in Northern Queensland – mainly north of Cairns. We have not seen evidence of the fruiting any further south than this unless in a greenhouse, however it is worth trying as far south as Rockhampton, if you can provide the right conditions. The tree is best described as evergreen with a natural pyramidical growth habit. Foliage is an olive green and the root system is not overly vigorous. The tree will send down a tp root which makes then difficult to transplant. Some grafted trees are available, most are grown from seed. Seedling trees are best grown under shade cloth for the first 5 years, they are slow growing at first. A humus rich deep soil with good moisture is essential. Try a protected position with good sun, perhaps some afternoon shade depending on the climate. Watering will be required during dry periods as will protection from strong winds. From seedling tree to fruit production usually takes around 6 – 8 years. No pruning is generally required, simply the removal of dead and damaged wood. 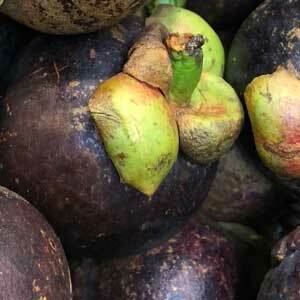 Achachairu or Achacha or Bolivian Mangosteen may be an easier tree to grow. Climate – Tropical areas only unless you create a microclimate. Drought Tolerant – No Protect from hot dry winds. This is a tropical climate tree, that may grow in some sub tropical areas, it will fruit in cooler climates, however a micro climate which provided both warmth and moisture will be required. Frost free is essential. Although a number of varieties are offered, it is the purple fruiting varieties that are grown commercially. Although plants can be grown from seed they are somewhat unreliable in fruit production and can take up to 10 years to produce fruit. This is not a fruit that packs or travels well and is not widely available. Garcinia tinctoria is the Yellow Mangosteen, segmented yellow fruit that can be eaten fresh or preserved or dried.